I am now writing from our bed on Larry, our lovely new little laptop (courtesy of tax free shopping in Chile)! Makes things a lot easier than trying to get to an internet cafe and hopefully means we’ll be able to upload all our photos. So almost 8 weeks to the day, we find ourselves back in Buenos Aires, having taken a flight, not quite as far as Rio (plan A) or as Iguazu (plan B) from Ushuaia. But the purse strings reign and this was the cheapest option…so once again we will be getting on a bus and I will chime the oft repeated “this is probably our last long bus journey in Argentina” up to some Jesuit ruins in San Ignacio for a few days before finally (over a month later than we had thought) we’ll arrive at Iguazu Falls. Before we arrived in Buenos Aires, we spent 6 days at the bottom of the world, drunk in the southern most city, eaten at “Fin del mundo” cafe and wallowed in all things Tierra del Fuego. And what a place it is. 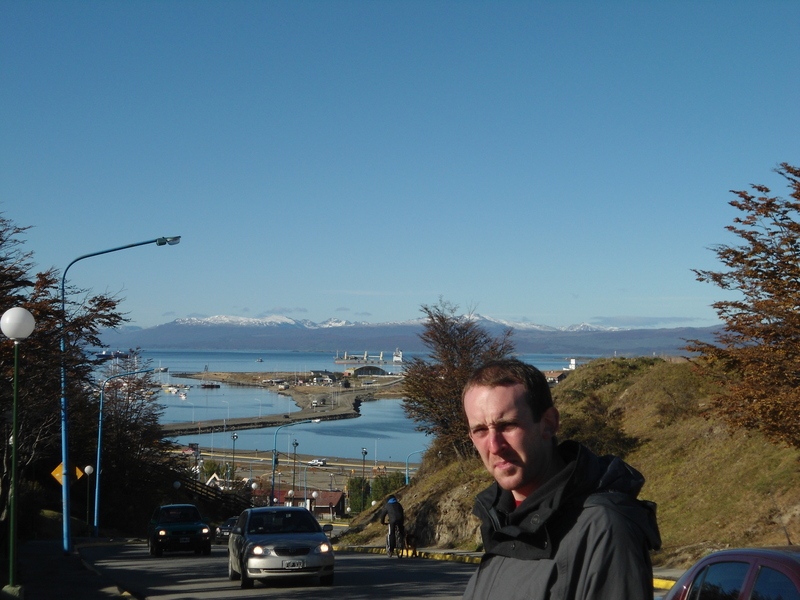 As we walked out of our B&B the first morning (we’d arrived in the dark the night before after a pretty gruelling 14 hour bus journey from Chile – DEFINITELY the worst journey yet) I couldn’t believe the stunning backdrop under which all the residents of Ushuaia live their daily lives. The port town (from which most Antarctic cruises depart) is surrounded by snow-capped mountains and fronted by a beautiful blue bay. There is enough going on to keep all the residents busy but it is still small enough to feel lovely and safe and like you can get to know the centre of the town in just a few days. 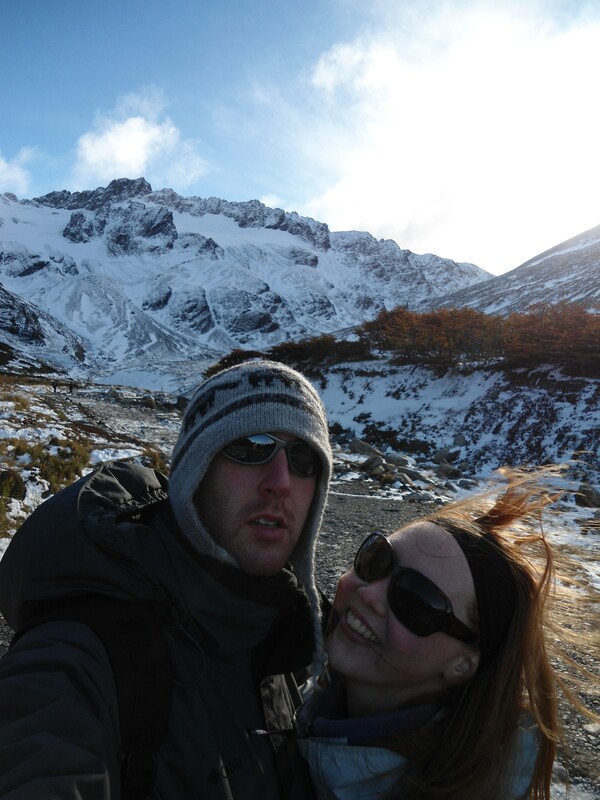 We spent our time there walking up to Glacier Martial (in the snow…there is a chance that I may have been a little grumpy walking most of the way up) but once we got to the top, although freezing, the views soon cheered me up. And I’ve always been a fan of walking downhill so the rest of the day was extremely pleasant indeed! We also visited the old prison (Ushuaia became a penal colony in the 1890s) which has been transformed into a great little museum, with displays on the maritime history (from the Yamana people – who were wiped out within a decade of westerners settling – to Antarctic rescues with icebreakers), the quest for the south pole and the prison itself. Unfortunately I didn’t learn an awful lot because most of the displays were in the old prison cells and they freaked me out so I spent most of the time just leaning in through the doorways to try and read what it was about! 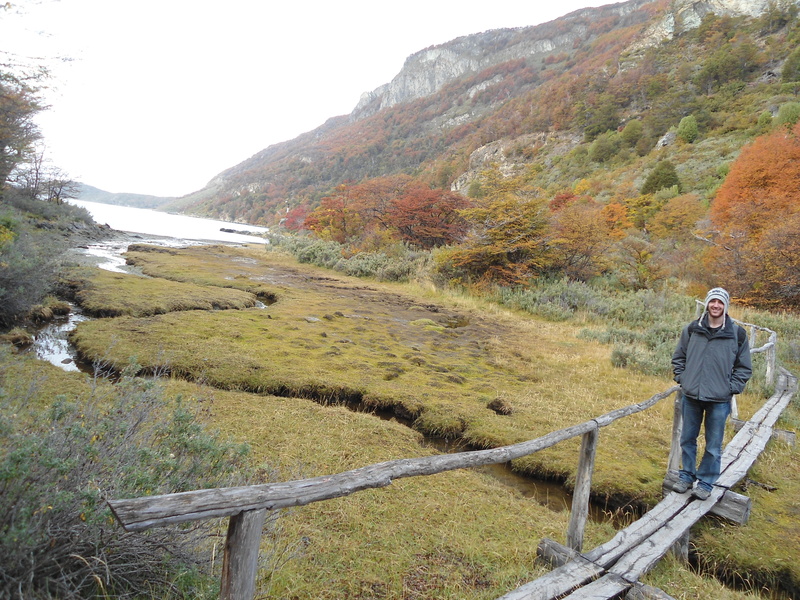 We also spent an amazing day at the Parque Nacional Tierra del Fuego, which was absolutely stunning. Autumn is in full swing in the park and we were completely surrounded by the most magnificent reds, golds, yellows and greens. The photos don’t come close to capturing it (I’ve uploaded quite a few more on the photos page) but I can assure you, it was breathtaking! There is also a beaver colony in the park…they were introduced from Canada a few decades ago and they’ve completely overrun the place and we did spot a few as the dipped and dived through the lake – they looked just like dolphins! They have made huge dams in a number of the rivers and decimated huge numbers of the trees in the park that apparently don’t grow back resulting in numerous eerie tree graveyards dotted around the place. We spent hours just sitting on the shore and listening to the absolute silence. Heaven. But here we are back in BA – a complete contrast! But I’ll leave James to fill you in on our time here in the not too distant future!